The ancient Celts believed that all life emanated from trees and that the oak tree was the most sacred tree associated with the light half of the year. The Irish word for oak tree is doire from which we get the word Dara. The Celtic Dara knot that is present on this Irish money clip represents the root system of the mighty oak and like the tree we have hidden strengths that we must use during challenging times. This Celtic money clip features a solid brass finding that is set with a gold plated over pewter emblem. The Dara knot money clip measures 1 3/4" in diameter and it is made in the United States. 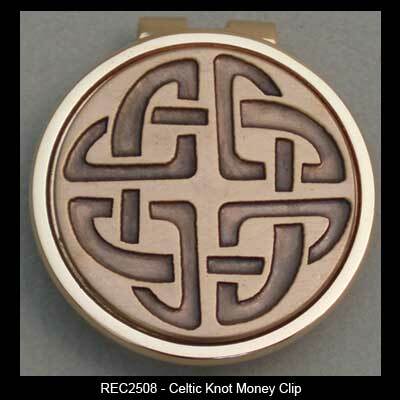 This spring loaded Irish money clip is gift boxed with a Celtic knot history card that is compliments of The Irish Gift House.